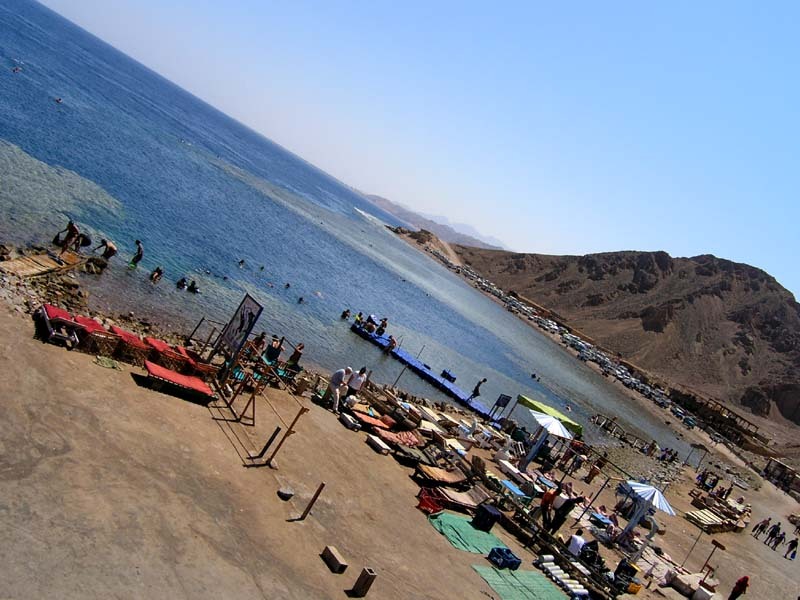 A quick tour of our latest accommodation in Dahab revealed that this was the best hotel so far. It was really something completely different compared to the first one in Cairo. It even had a pool. The water inside the pool had a suspiciously greenish tone to it but we enjoyed a swim anyway. Undeniably president Hosni Mubarak is a very important figure in Egypt (he has been the not-so-democratically-elected president of the country since 1981). 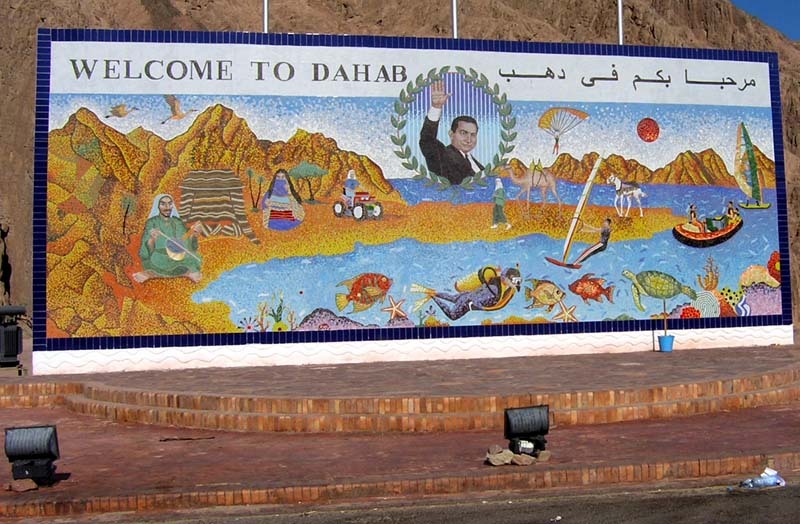 You can see his image on almost every corner and Dahab is no exception. He is always waving and smiling at people passing by. Early in the morning our guide arranged a ride to take us to the famous Blue Hole. It is one of the top diving sites in the world. The Blue Hole is just that - a very large hole over 200 m in diameter and dropping to over 80 m.
Obviously when snorkeling you shouldn't dive that deep. We didn't mind because there were just so many fish of all sizes and colors swimming around just below the surface. The coral reef begins at a depth of half a meter. We enjoyed every one of many trips to the water that day. Judging by the stone and metal plates on a nearby rocky wall all of the divers don't settle for a reasonable depth. So once in a while the Red sea decides to chew somebody up and then after a while it spits him out or swallows him forever. The time between snorkeling was mostly spent relaxing and enjoying delicious local drinks. We mostly drank freshly squeezed fruit juices and cocktails. I also tried a few games of backgammon. It seems like almost everybody plays backgammon in Egypt. If you ask a bartender at any Egyptian bar for the board and pieces, you have a pretty good chance he'll give them to you. Free of charge of course. Since most of the day was spent snorkeling, we were quite exhausted when we got back to our hotel. In the evening we decided to taste some of the stuff we saw underwater. We went to one of many restaurants lined up by the sea. It was quite expensive but in the end - worth it. Slowly we were starting to realize that we had just another day of Egypt left. Thanks for an interesting read and some absolutely stunning photos. 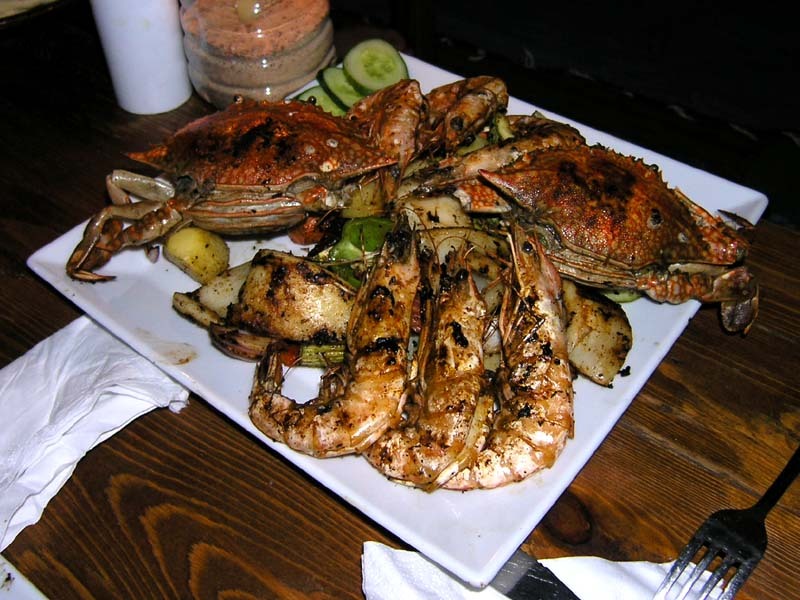 Egypt has always held a certain fascination for me and your blog has only whetted my appetite more! lmao sorry Pal but that aint a "President" nor a democracy. Egypt has a dictator been there now for what 30 years? so if thats your of idea of a president lol stay there man we don't need your kind here. Thanks for your support. I hope you enjoy the rest of it too. If voters only have one presidential candidate to choose from that aren't some democratic elections by my standards. But nonetheless the fact remains Pal: he is the president of the republic of Egypt (sources: CIA, Wikipedia), whether we like it or not. I went here in 1992, it was so beautiful (snorkeling) and I remember all the stories of divers getting trapped, etc...I stick to the snorkel!! !